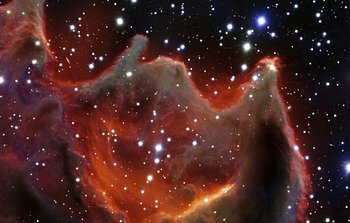 28 January 2015: Like the gaping mouth of a gigantic celestial creature, the cometary globule CG4 glows menacingly in this new image from ESO’s Very Large Telescope. Although it appears to be big and bright in this picture, this is actually a faint nebula, which makes it very hard for amateur astronomers to spot. The exact nature of CG4 remains a mystery. 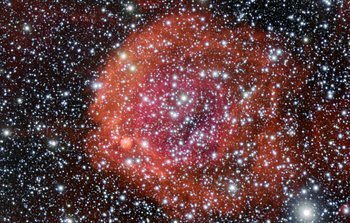 23 May 2013: With this new view of a spectacular stellar nursery ESO is celebrating 15 years of the Very Large Telescope — the world's most advanced optical instrument. This picture reveals thick clumps of dust silhouetted against the pink glowing gas cloud known to astronomers as IC 2944. These opaque blobs resemble drops of ink floating in a strawberry cocktail, their whimsical shapes sculpted by powerful radiation coming from the nearby brilliant young stars. 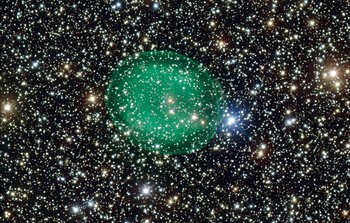 10 April 2013: This intriguing new picture from ESO’s Very Large Telescope shows the glowing green planetary nebula IC 1295 surrounding a dim and dying star located about 3300 light-years away in the constellation of Scutum (The Shield). This is the most detailed picture of this object ever taken. 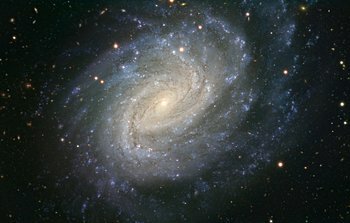 20 March 2013: About 35 million light-years from Earth, in the constellation of Eridanus (The River), lies the spiral galaxy NGC 1637. Back in 1999 the serene appearance of this galaxy was shattered by the appearance of a very bright supernova. 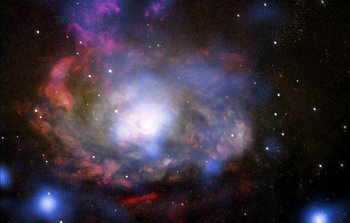 Astronomers studying the aftermath of this explosion with ESO’s Very Large Telescope at the Paranal Observatory in Chile have provided us with a stunning view of this relatively nearby galaxy. 1 August 2012: A new image taken with ESO’s Very Large Telescope shows the galaxy NGC 1187. This impressive spiral lies about 60 million light-years away in the constellation of Eridanus (The River). 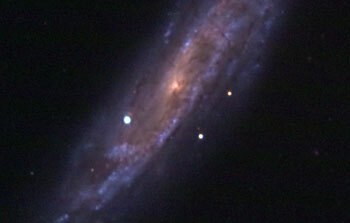 NGC 1187 has hosted two supernova explosions during the last thirty years, the latest one in 2007. This picture of the galaxy is the most detailed ever taken. 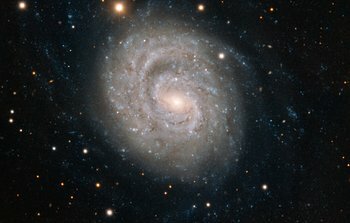 10 August 2011: This new picture from ESO’s Very Large Telescope shows NGC 3521, a spiral galaxy located about 35 million light years away in the constellation of Leo (The Lion). Spanning about 50 000 light-years, this spectacular object has a bright and compact nucleus, surrounded by richly detailed spiral structure. 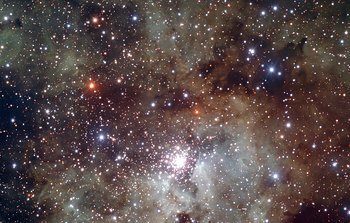 20 July 2011: ESO’s Very Large Telescope captured this striking view of the nebula around the star cluster NGC 1929 within the Large Magellanic Cloud, a satellite galaxy of our own Milky Way. A colossal example of what astronomers call a superbubble dominates this stellar nursery. It is being carved by the winds from bright young stars and the shockwaves from supernova explosions. 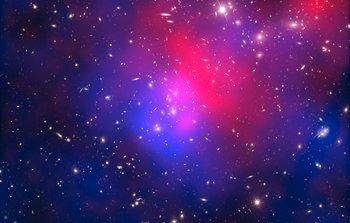 22 June 2011: A team of scientists has studied the galaxy cluster Abell 2744, nicknamed Pandora’s Cluster. They have pieced together the cluster’s complex and violent history using telescopes in space and on the ground, including ESO’s Very Large Telescope and the Hubble Space Telescope. Abell 2744 seems to be the result of a simultaneous pile-up of at least four separate galaxy clusters and this complex collision has produced strange effects that have never been seen together before. 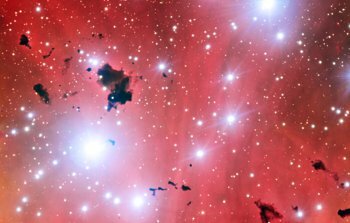 30 March 2011: The vivid red cloud in this new image from ESO’s Very Large Telescope is a region of glowing hydrogen surrounding the star cluster NGC 371. This stellar nursery lies in our neighbouring galaxy, the Small Magellanic Cloud. 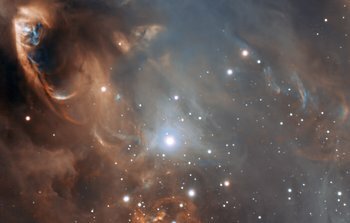 16 March 2011: A new image from ESO’s Very Large Telescope gives a close-up view of the dramatic effects new-born stars have on the gas and dust from which they formed. Although the stars themselves are not visible, material they have ejected is colliding with the surrounding gas and dust clouds and creating a surreal landscape of glowing arcs, blobs and streaks. 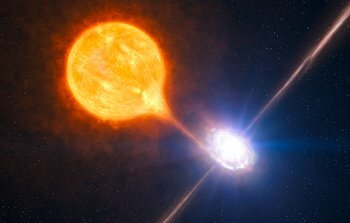 7 July 2010: Combining observations made with ESO’s Very Large Telescope and NASA’s Chandra X-ray telescope, astronomers have uncovered the most powerful pair of jets ever seen from a stellar black hole. 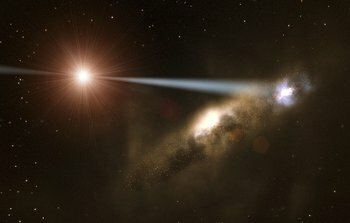 This object, also known as a microquasar, blows a huge bubble of hot gas, 1000 light-years across, twice as large and tens of times more powerful than other known microquasars. The discovery is reported this week in the journal Nature. 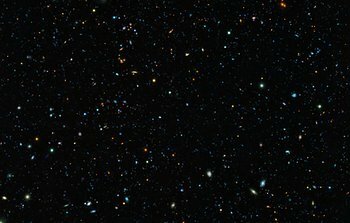 24 March 2010: Astronomers have long known that in many surveys of the very distant Universe, a large fraction of the total intrinsic light was not being observed. 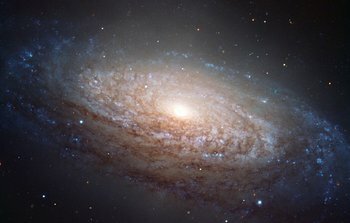 Now, thanks to an extremely deep survey using two of the four giant 8.2-metre telescopes that make up ESO’s Very Large Telescope (VLT) and a unique custom-built filter, astronomers have determined that a large fraction of galaxies whose light took 10 billion years to reach us have gone undiscovered. The survey also helped uncover some of the faintest galaxies ever found at this early stage of the Universe. 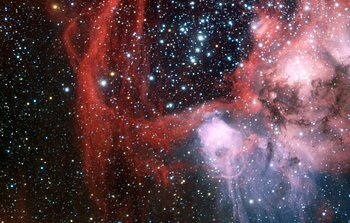 3 February 2010: ESO is releasing a magnificent VLT image of the giant stellar nursery surrounding NGC 3603, in which stars are continuously being born. Embedded in this scenic nebula is one of the most luminous and most compact clusters of young, massive stars in our Milky Way, which therefore serves as an excellent “local” analogue of very active star-forming regions in other galaxies. The cluster also hosts the most massive star to be “weighed” so far. Black Hole Caught Zapping Galaxy into Existence? 30 November 2009: Which come first, the supermassive black holes that frantically devour matter or the enormous galaxies where they reside? A brand new scenario has emerged from a recent set of outstanding observations of a black hole without a home: black holes may be “building” their own host galaxy. This could be the long-sought missing link to understanding why the masses of black holes are larger in galaxies that contain more stars. 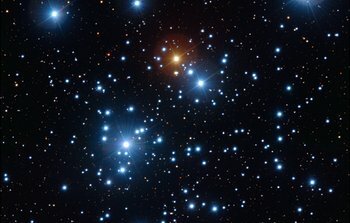 29 October 2009: The combination of images taken by three exceptional telescopes, the ESO Very Large Telescope on Cerro Paranal , the MPG/ESO 2.2-metre telescope at ESO’s La Silla observatory and the NASA/ESA Hubble Space Telescope, has allowed the stunning Jewel Box star cluster to be seen in a whole new light. 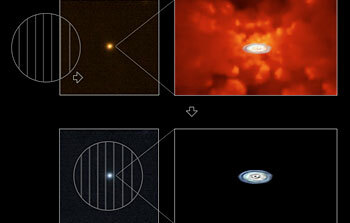 12 December 2008: Combining a double natural "magnifying glass" with the power of ESO's Very Large Telescope, astronomers have scrutinised the inner parts of the disc around a supermassive black hole 10 billion light-years away. They were able to study the disc with a level of detail a thousand times better than that of the best telescopes in the world, providing the first observational confirmation of the prevalent theoretical models of such discs. 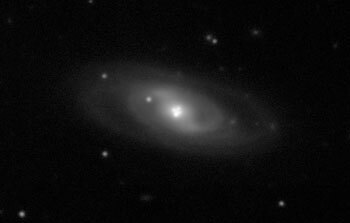 25 September 2008: Over a decade after it exploded, one of the nearest supernovae in the last 25 years has been identified. This result was made possible by combining data from the vast online archives from many of the world’s premier telescopes. 24 July 2008: A European-led team of astronomers are providing hints that a recent supernova may not be as normal as initially thought. Instead, the star that exploded is now understood to have collapsed into a black hole, producing a weak jet, typical of much more violent events, the so-called gamma-ray bursts. The object, SN 2008D, is thus probably among the weakest explosions that produce very fast moving jets. This discovery represents a crucial milestone in the understanding of the most violent phenomena observed in the Universe. 23 July 2008: Quasars are the brilliant cores of remote galaxies, at the hearts of which lie supermassive black holes that can generate enough power to outshine the Sun a trillion times. These mighty power sources are fuelled by interstellar gas, thought to be sucked into the hole from a surrounding 'accretion disc'. A paper in this week's issue of the journal Nature, partly based on observations collected with ESO's Very Large Telescope, verifies a long-standing prediction about the intensely luminous radiation emitted by these accretion discs. 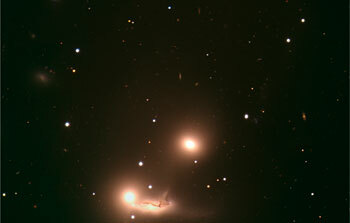 21 January 2008: An image based on data taken with ESO's Very Large Telescope reveals a triplet of galaxies intertwined in a cosmic dance.